Belgium striker Michy Batshuayi has hilariously trolled himself after kicking the ball into his own face while attempting to celebrate Adnan Januzaj’s goal against England in the team’s final Group G game. 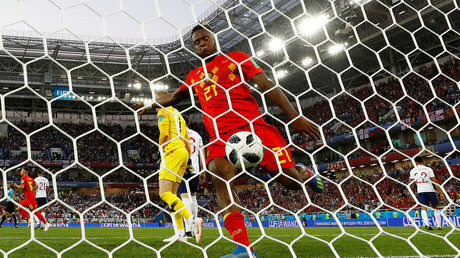 Batshuayi made the howler when picking the ball out of the England net following Januzaj’s peach of a goal and attempting to stylishly fire the ball skywards. Instead, the ball cannoned off the near post and directly into the striker’s face, much to the embarrassment to The Red Devils’ number 21. Not surprisingly, Twitter found the moment hysterical, and provided their own commentary on the gaffe. However, the striker later laughed off the incident, tweeting: “Fortnite celebrations so overrated bro I had to create something new” with a gif of his moment of glory in the England goal. The tweet is a reference to computer game Fortnite, popular among players, some of whom have mimicked the movement of the game’s characters as goal celebrations. Januzaj’s goal proved the difference between the two sides as Belgium topped the group with a 1-0 win, setting up a date with Japan in Rostov-on-Don. England finished in second place and with play Colombia in Moscow at Spartak Stadium.